Love peanut butter cups? 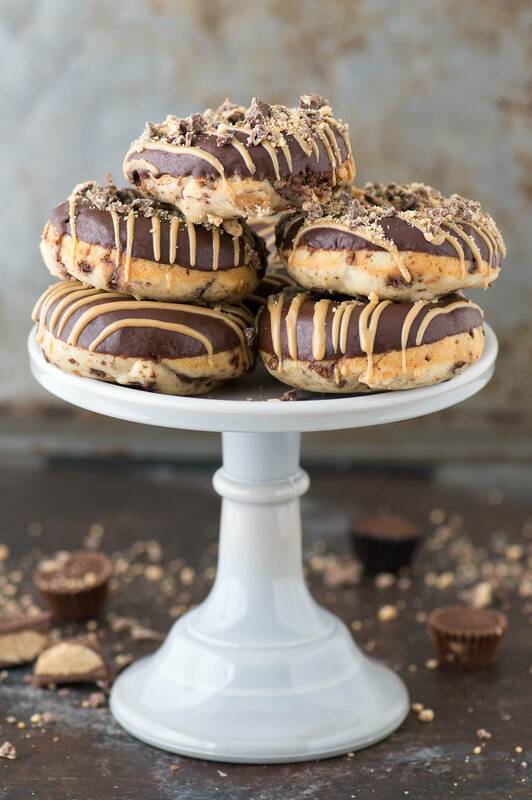 Make homemade donuts stuffed with peanut butter cups, topped with chocolate ganache and peanut butter drizzle. 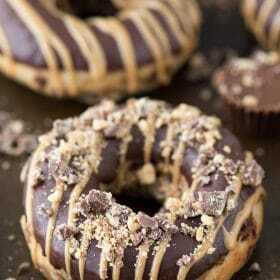 Stuffed Peanut Butter Cup Donuts! Anyone want to come over for breakfast? 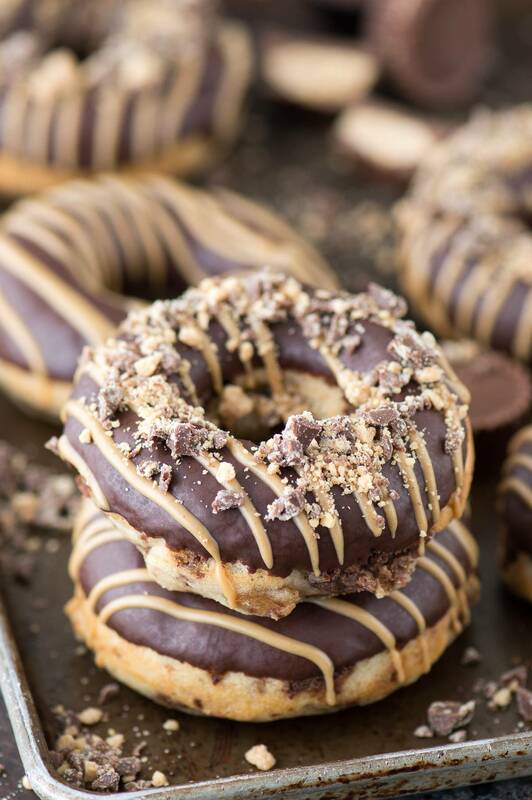 We’ll be having donuts stuffed with mini peanut butter cups, topped with chocolate ganache and drizzled with peanut butter. Or maybe you’re not such a donut for breakfast person (to tell the truth, I’m not – I’m a oatmeal for breakfast girl!) – good thing these donuts make a great 8pm snack! Confession: I always have peanut butter cups in the house. For a while they were in the pantry. That became too tempting, I mean I’d be looking for a granola bar and I’d see the peanut butter cups staring at me, so they went in the fridge. But they ended up on the top shelf in the door of the fridge, and I would see them every time I went looking for the ketchup, jelly, or the 50 other condiments we stash in there. So they moved to the only other place.. the freezer! Now they are hiding way behind the frozen chicken and a bag of french fries. Good thing we don’t seem to interested in eating the french fries.. otherwise hello peanut butter cups! 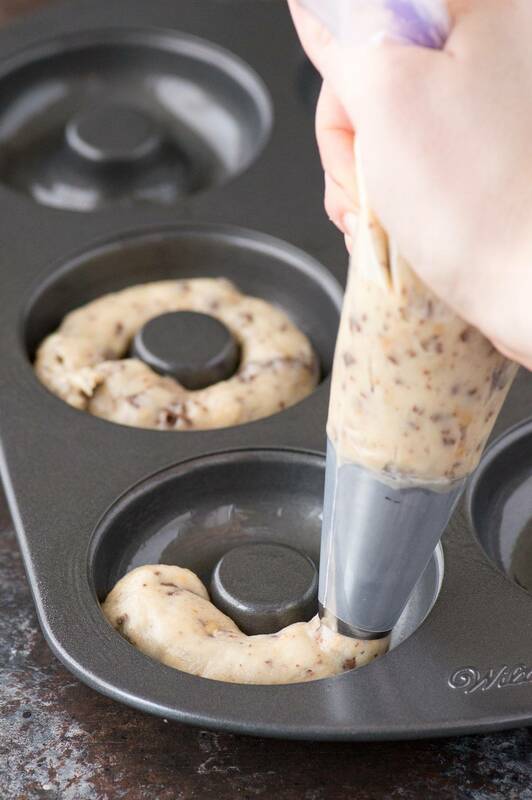 The easiest and cleanest way to get the donut batter into the pan is to use a piping bag with a wide circle tip. You can also make a piping bag out of a ziplock bag. Take a look below to see what they look like once they are baked! Allow the donuts to cool completely before dipping them into the melted chocolate. If the donuts are still warm, they could crumble or break when dipping them. The peanut butter drizzle is super easy to make – just peanut butter and a little bit of oil melted together. You could also add a few more chopped reese’s to the tops of the donuts if you’d like. 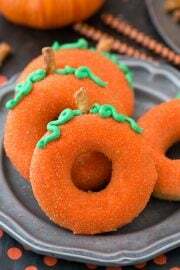 These would be a fantastic donut to make around Halloween time – it will help you use up leftover halloween candy! 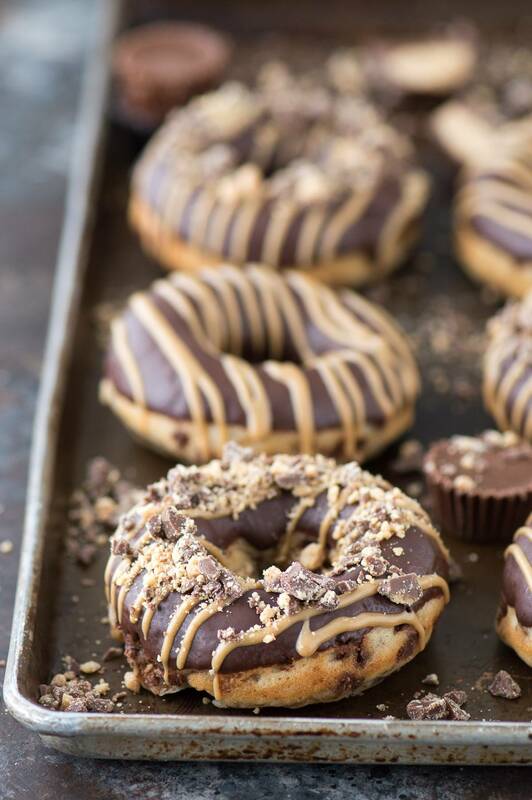 Or you could surprise your family with these peanut butter cup donuts as a “let’s get excited for Halloween” treat! But really, we all know that we want to make these donuts NOW! Preheat the oven to 325º F. Spray a donut pan with cooking spray, use a paper towel to lightly spread/remove excess spray. In another bowl, combine the milk, eggs, vanilla, and oil. 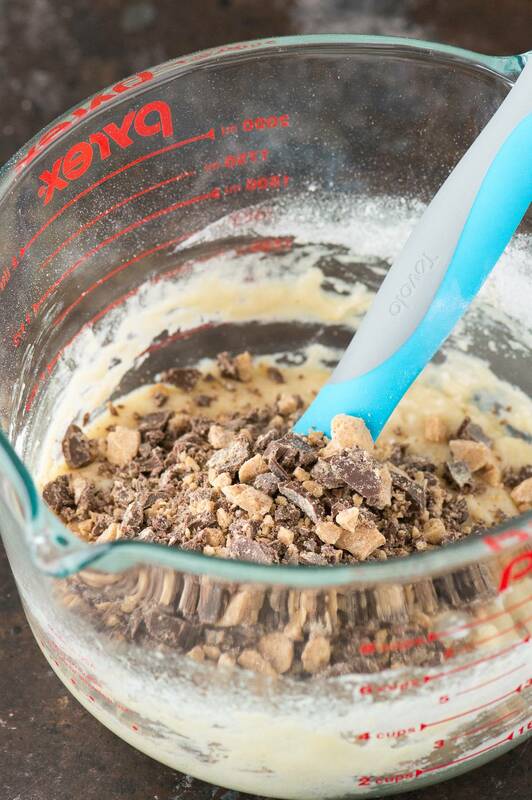 Stir the dry ingredients into the wet ingredients adding the chopped reese's as well, mix just until combined. 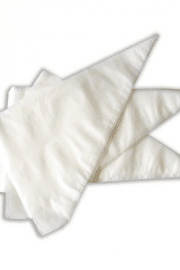 Transfer the batter to a large piping bag or use a ziploc bag with one corner cut off. Pipe the batter into the donut pan, filling each donut hole about 2/3 full. Bake the donuts for 10 minutes, or until a toothpick comes out clean. Remove from the oven and let the donuts sit in the pan for 5 minutes before removing them from the pan. Cool completely before dipping. Combine the chocolate and oil in a shallow microwave safe bowl and microwave on 60% power, stirring every 30 seconds for about 2 minutes. You do not want the chocolate to be too runny. Let the chocolate sit for a few minutes so it can thicken before you dip the donuts into the chocolate. Dip each donut into the chocolate, allowing the excess to fall off. Let the chocolate covered donuts sit for 3-4 minutes before adding the peanut butter drizzle. Combine the peanut butter and oil in a shallow microwave safe bowl, and microwave on 60% power for 1-2 minutes, or until the peanut butter is melted. Drizzle the peanut butter over each donut, using a spoon. Serve and enjoy or store in a tupperware container. Erin, your sweet comment made my day! THANK YOU!! Nice pics & these donuts look delish! All of your doughnuts look almost too pretty to eat! Good thing they are also irresistible! :) Peanut butter and chocolate are everyone’s favorite flavor combo. These doughnuts won’t last long around here! Pinned. Thanks! They didn’t last long around here either! Yum!!! These are amazing! They look so perfect! Definitely pinning this! I need to get a donut pan! 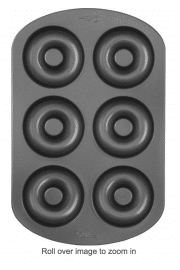 I highly recommend a donut pan! I would love these! I love peanut butter cups. Wow, I’ve been looking for a baked donut recipe and these look amazing! Yikes, love it! 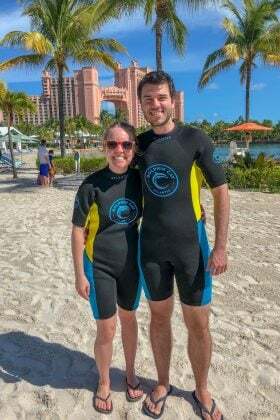 It is amazing, enjoy Jess! Those look delicious Beth, I love peanut butter cups. 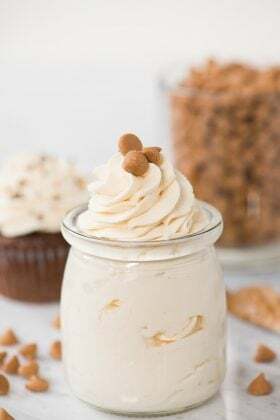 I co-host Sweet and Savoury Sunday and would love for you to stop by and share these and other recipes with us when the party goes live tonight . Have a great day! Laura, thanks for inviting me over! Hi Nic! 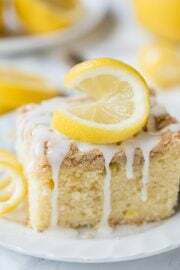 I certainly appreciate you stumbling our recipe! These look so tasty! 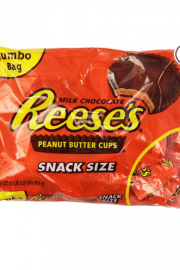 We bought a huge bag of mini peanut butter cups on sale after Easter and I’ve been hoping to find a recipe to use them with. Oh gosh.. can I come over?! These need to get in my life! They look amazing!! Haha, I hope you’re able to make them! Sounds like my kind of breakfast! Thanks for the invite, I will be right over :) And I will bring the milk and coffee! Pinning this so I can try it! I’m drooling! These are insanely over-the-top and I love it! Definitely going to be making these in my donut pans. Pinned! These are my kind of donuts! Wish I had one right now! I wish I could share them with you Jessica! Beth you are like a donut genius! Seriously love this! Ha, thank you Nancy. I sure do like donuts. I didn’t know donuts like this could exist! Holy moly, they look fantastic! Hahaha, they existed in our house for 1 day! Um. Yes, please!! These are totally happening in my kitchen soon! Stopping by from Family Fun Friday’s. What a fun recipe. Looks delicious! These are so ridiculously awesome! Can’t wait to make these for my sons, thanks! You son is super duper lucky!! These are too good to be true!!! Dying over the yumminess – pinned to Saturday Night Fever board and my donut board! 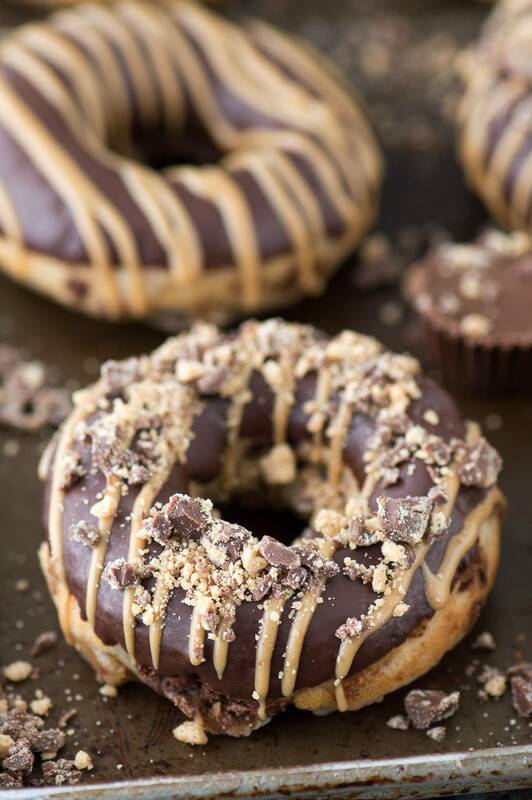 Peanut Butter Cups in a Donut! Oh yes please! Thank you so much for sharing at Tasty Tuesdays. Pinning NOW! 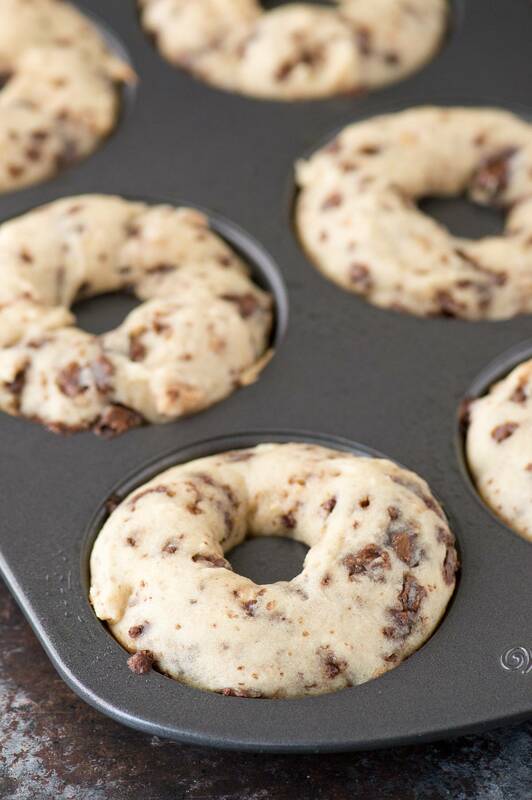 YES I am definitely coming over for breakfast sometime….as long as you are making one of your delicious donut recipes! These look ah-mazing, Beth!! 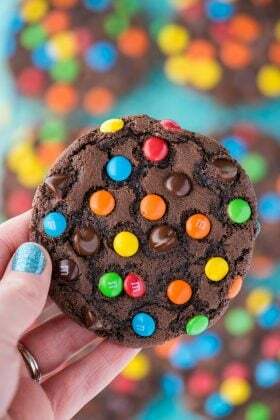 These look amazing Beth! Can’t wait to try them. Pinning! I am always drooling after visiting and seeing all of your amazing dishes. Ah-Mazing. These look heavenly dangerous! Great pics! 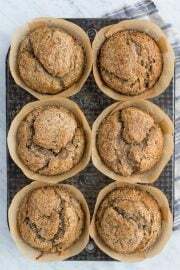 Can these be made without a donut pan? Should I even try without one?